Emily Campbell was born in Chicago in 1878, a first generation Norwegian-Scot-American, with a brother Arthur, 9, sister Elizabeth, 4, and brother Christian, 3. Her father John was a skilled carpenter and wood-worker, working six days a week to rebuild Chicago after the fire of 1871. Her mother Mary Ann was a fulltime homemaker in their comfortable apartment on Otto Street until John's death in 1892. Sister Elizabeth died in the terrible typhoid epidemic of 1890. The brothers had left home, so Mama and Emily moved into a smaller flat, and Mama found work in the neighborhood bakery. The story opens in 1896 when Emily is a senior at North Lake High School. She and her dear friend Phoebe are ice skating on the Lincoln Park Lagoon. She comes upon a student preacher practicing a sermon along the snowy shoreline. Henry, 23, is a middler at McCormick Seminary, and their chance encounter is the start of a long love. After high school, Emily has one goal in life: to be the best typist at the business college. She graduates and is employed in the research department of the Chicago Public Library. Once she and Henry become engaged, she adds a new goal: to be the best minister's wife. As the young couple sets forth in the Gospel ministry, each one faces the challenges of solving problems for others. Henry is absorbed in his role as pastor, and Emily creates ways to augment his ministry. She starts libraries, collects clothing for poor children and teaches her business school skills to her friends. Henry and Emily make a good team, but she is never sure she is being the best wife. Congregations offer her advice on child-rearing and making her laundry whiter. She tries to understand Henry's call, but she never anticipated moving to other towns. When she becomes assertive enough to suggest taking a job, Henry is dismayed. Humor plays a part in their marriage as well as serious conversations. Their marriage and parenting of two sons take place against a backdrop of amazing progress in inventions of the early 1900's: paved roads, automobiles, telephones, indoor plumbing, electrification and medical advances. Theirs is not an easy life, and readers may marvel at how churches and their founders survive and prosper. Threats to their happiness come from two world wars, a great depression, deaths in their family and small town gossip. In each location, historic facts and newspaper reports add validity to the story. They move twice in Illinois, then to Idaho, and on to Salt Lake City before returning to Hanover, Indiana, where Henry is the pastor and also an officer on the college staff. At last he is able to teach and counsel with students, his favorite age group for ministry. When Emily is widowed, she finds written evidence in Henry's speeches that she was always his "dearly beloved." Note: The research for this book was based upon an inherited collection of the papers, church correspondence and academic records of The Reverend Dr. Henry Walter Burger, 1873-1942. He wrote prolifically and kept meticulous records. He was famous on campus for his jaunty red felt hat which is in the college archives. 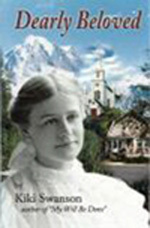 The cover picture of Emily is dated 1896.